App store analytics firm Distimo recently released a bunch of juicy info about the major mobile app stores, and the results are pretty interesting. 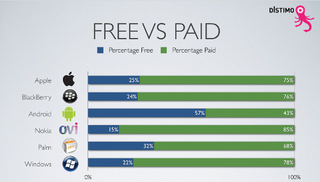 For one, Android has a much higher proportion of free apps. Apple and BlackBerry are pretty close with their app stores, offering free apps making up 25% and 24% of their respective stores. Android more than doubles that number with 57%. Of course, with the size discrepancy between the stores, Apple still offers up more free apps than Android's entire store, but it's still interesting to see the relative differences. Surprisingly, the number of free apps doesn't drop the average price paid for paid apps down in android. Apple's average paid price is $3.62, while Android's is $3.27. BlackBerry, on the other hand, shoots way up with an $8.26 average. This is due to price variations across the app stores for the same app. IM+, for example, is $4.99 in Apple's store and a whopping $29.99 in BlackBerry's.